This entry was posted in Vacuum Tubes and tagged 6AK5/EF95, Mullard by tubemaze. Bookmark the permalink. This is one rare tube. Made by RT in France for Mullard. The tube has blue glass in places where plates open up to reduce electron emissions. The tubes is crazy transparent, which is good, but could be bad in some systems. If your system is already bright or your headphones are lean and bright, think HD850 – this tube might be too much. with my HD650, the sound was very detailed, dynamic and sparkly. Sound stage was just huge! All in all a beautiful looking and sounding tube. These listening impressions of various 5654/6AK5/CV4010/EF95 tubes are made with one of my two headphone amps, a Little Dot MK IV. My two main headphone amps are the Bottlehead Crack and the Little Dot Mk IV. I use Sennheiser HD 600 and HD 650 headphones. I got the Little Dot MK IV first, and went a bit overboard with “tube rolling”…. I got obsessed with “tuning” the sound and stopped listening to the Music, instead listening more to the Sound of each 5654 type. I’m in recovery now ;0). That said, I DID hear some radical differences with different members of the interesting EF95/5654/6AK5 family installed in the Little Dot. All tubes got at LEAST a 25 hour burn-in before serious evaluation. This is very important with true NOS vintage tubes– they need to “wake up” with some usage before they bloom. I found the U.K. military Mullard CV4010/M8100 version of the 5654/6AK5 a great performer in nearly all areas. Vintage 1970s British Mullard CV 4010s are slightly warm sonically, very musical, and present great depth of soundstage with a wideband yet balanced frequency response. The British Mullard is not the last word in transparency, but their 3D imaging and midrange texture/inner detail are outstanding. The U.K. Mullard CV4010 has one minor flaw–a slight rise in the mid-bass region that is OK and even pleasing 9 times out of ten. However, on certain complex multi-track rock and pop LPs the U.K. Mullard CV4010 can at times sound slightly… bloated. This fault doesn’t come up often– I noticed it first on my black-ABC-label pressing of Steely Dan “Pretzel Logic” and again on my 1st pressing of The Talking Heads “Speaking In Tongues” LP. On the rare times it is there, this slight bass bloat is distracting. Still, this is a NEARLY perfect 5654/6AK5 type. I give the UK Mullard a solid 9 out of 10. Prices have been rising because the “SE” version of the Little Dot MK IV comes with U.K. Mullard CV4010s installed at the factory– the time to buy is now. The GE JAN5654W (especially the 1963 JAN 5654W “Green Lettering” examples of the GEs I tried) is an affordable, common, and great-sounding tube. However, the GE JAN5654W is just a bit more clinical, or slightly “cooler” than the Mullard CV4010. The GE has a nicely balanced frequency response, nice detail level… but just doesn’t make as much MUSIC as the U.K. Mullard. Perhaps it is the GE’s slightly recessed lower midrange. Still, the GE earns an easy 8.5 for sonics; look for 1960’s production G.E.s with green lettering on the tubes. 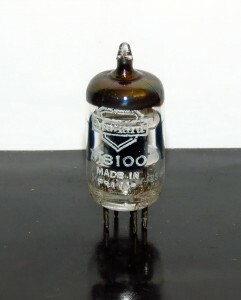 The RTC/Mullard-France CV4010 is similar sonically to the UK Mullard CV4010 but the French-made tube has a slight rise in the treble response curve. This slight rise in the treble response gives a sense of detail and transparency which is great for older analog vinyl with high resolution as well as female vocal LPs, but was a BIT edgy with “Being There” by Wilco, and my German 1970s pressing of the “Animals” LP by Pink Floyd. Not harsh, just a bit of an edge. That said, with the French Mullard CV4010 I could “see” layers and layers of vocal overdubs and guitar tracking on The Beatles Abbey Road (UK 1st pressing) that is tremendously satisfying. The RTC/Mullard will not disappoint, especially with dense, atmospheric recordings that one wishes to snap into sharp focus. I tried a number of other 5654/6AK5 variants with mixed results. I was incredibly let down and disappointed by the Western Electric version of the 5654/6AK5—the W.E. 403a; with WECO’s incredible reputation (and high price) I thought it would be a “super-tube”. The actual sound was quite the opposite. The sound was rather flat, thin, and un-involving. I allowed plenty of time for the Western Elecs to break-in, but they barely improved. SOMEBODY must like these, or maybe like the “idea” of them… because of the high price and relative rarity… but I can’t imagine it. The 403a is clean and cold sonically; not a fun listening experience. Think early, bad digital and you have the Western Electric sound. I give a 6.5 out of 10 to the Western Electric 403a. Many other 5654s, like the nickel plate Sylvania in the green boxes… the various RCAs, and many more are not really worthy of much discussion because they are “good but not great” Life is too short for “OK” vacuum tubes! Especially with the cheap, great, and widely available JAN GE5654W. The UK Mullard CV4010 is better than the GE JAN5654W by a small degree, mainly in warmth and inner detail, but the GE is a very, very good 5654/6AK5 type and costs much less than a Mullard CV4010 , if you are on a budget. Be certain to get the GE JAN 5654W or the FAA version; the standard white letter GE 5654 is mediocre while the “5 star”-labeled GE 5654 is better but not to the standard of the JAN 5654W version of the GE. I saved my personal favorite type, and certainly the biggest surprise in the entire EF95/5654/6AK5 family for last. I expected nothing from this tube but was blown away! This may be hard to believe, but much comparison and confirmation (and consultation with audiophile friends) makes me select the pre-1980s vintage Soviet-era Voskhod 6J1p-EB as my all-around FAVORITE 5654-type. I know, I know. “REALLY?” Really. The Voskhod “Rocket Logo” 6J1p-EB? The tube that smart shoppers can get for about $2-$3 EACH on eBay? O.K.– before I am dismissed as deaf.. or insane.. I have to explain. I initially HATED my Voskhod 6J1p-EB tubes; they were even worse than the Western Electric 403a and the plain-jane “regular” white-letter G.E. 6AK5/5654. My first impressions of 6J1p-EB were of a tube that was cold, muffled, un-involving, flat…. almost lifeless. However, information abounds on the internet that to REALLY HEAR the Vohksod 6J1p-EB for the amazing tube it is, it needs at least 50-75 hours of break-in time, actually playing music… not just sitting in an amp that is powered on. I connected a CD player set on “repeat” to the inputs of the Little Dot, and in 6-8 hour “shifts” I began to give the Voskhods a lengthy burn-in. I can’t stress this enough; it was “night and day” as far as sonics before and after proper burn-in time of 75+ hours for the Vohksods. Be certain to get the genuine Voskhod 6J1p-EB (they have the rocket logo); the Novosibirsk 6J1p is vastly inferior. The -EB suffix indicates a 5000 hour tube; the best of the best have a “rhombus” geometrical symbol on the glass indicating individual testing for true military acceptance. When I re-connected my analog signal chain to the Little Dot MK IV at the 75 hour mark of burn-in for the 6J1p-EB tubes and sat down to spin some reference vinyl Lps, I couldn’t believe they were the same tubes I had heard just days earlier. I have never, ever heard such a dramatic change in ANY tube following burn-in. The Voskhod 6J1P-EB quite simply gets everything right. Or maybe “The Voskhod does everything best of all the many 5654-family tubes I tried” is more apt. It is extremely detailed without ever being fatiguing– this tube shines a clean white light into the furthest corners of the soundstage of great recordings to reveal everything there. Voskhods resolve everything, miss nothing, and add nothing extra. Imaging is terrific with HUGE, cleanly-defined depth and width of soundstage… the headphones almost “disappear” in the flow of 3-D sonics ( It’s a cliche, but it’s true) The defining characteristics of the Voskhods are absolute transparency, inner resolution of fine detail and textures, 3-D imaging and stunning dynamics. Oh, and NEVER a sense of fatigue… ever. Playing the opening tracks on my black label Reprise “Tonight’s The Night” LP by Neil Young was truly startling. This is an all-time reference recording that is SO demanding of every element in the signal chain. With the 6J1p-EBs in place, the piano in the right channel of “Speakin’ Out” practically physically pulses against the ear, and no other tube conveys the stark, black emotion of songs like “Borrowed Tune” and “Mellow My Mind”. When Neil Young’s voice heart-rendingly breaks during the latter, I heard details I have NEVER heard… namely a faint, raspy rustling of air passing over his vocal cords, and Young’s small movements closer and further away from the vocal mic as he switches from the vocals to his astounding harmonica. Delicate inner detail as well as a huge 3D soundstage– the Voskhods resolve everything. The Voskhod presents such an ambient, extended, and detailed (but never fatiguing) treble response that it is easy to overlook its phenomenal bass response. Of all the 5654 types I listened to, only the 6J1P-EBs reproduce bass that is at extended and tonally neutral, but also extremely strong and punchy. The phrase I jotted down while listening was “bass has a real physical presence” My main complaint with all types of headphones is that they lack the realism of bass response that large monitor speakers can convey. While even the most amazing 5654 tube will not enable headphones to produce bass with a physical rumble, the 6J1p comes closest to presenting real bottom end on fine recordings. Add to this a layered, textured and always musical midrange, and one has near perfection; one has the Voskhod 6J1p-EB. There is no doubt– pre 1980s Voskhods are a 10 out of 10. Seriously. 10. Add to the great sound the fact that NOS, Individually boxed, 1970s Soviet production premium 6J1p-EB vacuum tubes with nickle-molybdenum pins and gold/platinum alloy grid wire costs a crazy-cheap $2 to $3 each on eBay, and it becomes harder still to believe greatness the Voskhod 6J1p-EB. From eBay seller el-rayder I received TEN NOS 6J1P-EB tubes for just $15 plus $10 shipping. $2.50 each…shipped. With a lifespan of 5000 hours, that’s about 1 penny for a long session with the Voskhod 6J1p-EB. You cannot afford to NOT give them a try at this price. Hello eicoeico! Your comment has been very educational and inspiring for me. I’m starting in the world of tubes and I want to follow your advice. I searched ebay for the voskhod 6j1 (rocket logo and rombhus) and found three different versions: “new”, “tested” and “matched”. Is it necessary for them to be “matched” to achieve the incredible performance you mention? Or they would serve me if they are simply “tested” or “new”. I hope you read this comment and you can help me. Thank you so much for everything. Greetings from Spain! !